Published on 3 August 2008. I’m surprised to find that we’re already into the second half of my Summer Books series, shocked to find that I’m writing about an autobiography, and amazed to be giving it a good review. I should explain that I’m no fan of autobiographies, which are all too often shallow, self-important descriptions of dull lives by bad writers. 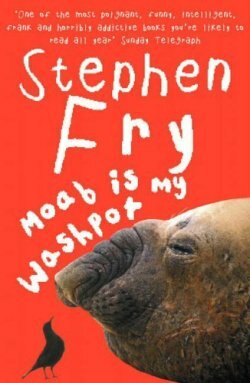 Yet this week’s choice is Stephen Fry’s Moab is my Washpot – not only an autobiography, but an autobiography restricting itself to the first twenty years of someone’s life – How interesting can that be? Well, so it turns out, very interesting. The late Linda Smith would undoubtedly criticise me for saying so, but Stephen Fry is a masterful wordsmith: He smiths those words like a true master, and it makes for a great read. This autobiography is a combination of painfully honest recounting of sometimes shocking childhood tales, insightful reflection, and tangential anecdotes and laced with Fry’s trademark humour. The candour of the recollections is quite remarkable, and Fry’s defence of his childhood upbringing robust, whilst stopping short of becoming a polemic on the rights and wrongs of bringing up children. There are times when it feels that the drive behind the book is catharsis rather than entertainment, almost as if listening in to a counselling session with Fry. This, combined with a style of writing which feels almost as if Fry is recounting tales to you personally, makes one feel that one really knows the real Fry, rather than the media personality. This is certainly the greatest autobiography I have read to date. From the reminisce of Matteo, which is a wonderful tale of unrequited love from the basest to the highest level, to the tale of references to moles when revisiting his old school, which is humorous, exploratory, and somehow both flippant and deep, this book is absolutely great. It comes very highly recommended, and if you only buy one of the six books I’ve reviewed thus far, this should undoubtedly be it. You won’t regret it. This review has been written exclusively for the ‘Summer Books’ series of reviews published on sjhoward.co.uk and Gazette Live. This 1,363rd post was filed under: Summer Books, Books, Gazette Columns, Stephen Fry.